• How to operate a microwave oven Enjoying the servitude of robots and tips for living underground when they inevitably rise up against us. Tons more! A fascinating and hilarious book—don’t go time traveling without it! 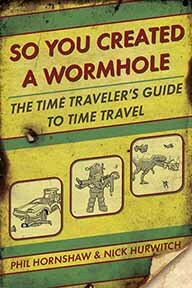 SO YOU CREATED A WORMHOLE: The Time Traveler’s Guide to Time Travel By Phil Hornshaw and Nick Hurwitch 336 Pages. 6x8 Paperback. Illustrated. References.